The zodiac sign of Aries is dominated by the ruling planet of Mars. Earlier the planet of Scorpio sun sign, Mars has been named after the Roman God of War who was said to be daring and totally fearless. The same quality can be found in the personality of an Aries individual. He is just like a child, who does not fear anything or anybody. The ruling planet of Mars provides an Aries individual with the endless supply of strength, vigor, vivacity and endurance. It instills in him the quality of coming straight to the point, rather than dilly-dallying. The planet is identified with traits like standing up for what is wrong and fighting for what is right. A Mars individual is always one of the pioneers, the initiators. He is always determined to move ahead in right, irrespective of how much and how potent the obstacles in the way are. The ruling planet of Mars makes him completely sure of his abilities and instills in him guts, a sense of adventure as well as a strength of purpose. He may, at times, act without giving much thought to the consequences of the actions taken. The planet also imparts mental strength, liveliness and the resolve to succeed. Such individuals move ahead in life without fear and full of drive, determination and fortitude. The courage sometimes makes them blind to the dangers ahead, which may catch them unawares and throw them off balance. However, the drive to move ahead and achieve the goal is so strong that such a setback manages to stop them only temporarily. Then, they again move ahead with the same fierce determination. Mars ruled people also show a preference for sports, adventure and travel. They are quite honest and dependable and show an aptitude for mechanical skills. On the negative front, Mars may instill in them impatience, brutality, arrogance, impulsiveness, jealousy and a propensity to indulge in futile and wasted battle. The planet does not instill a foresight in the individuals and for that, they have to take outside help. Items linked with Mars are honeysuckle, geranium, holly, pine, rhubarb, pineapple, woodpecker, eagle, tiger and shark. The planet seems to be very closely associated with the metal iron. Jasper and Rubies are the preferred gems for the individuals born under the influence of Mars. Their lucky day will most probably be Tuesday. The bold and angry colors, like blood red, are the colors considered as lucky for them. 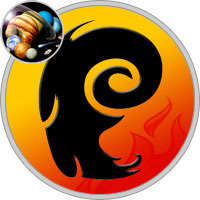 Aries is ruled by Mars, the fiery red planet of energy and drive. In mythology, Mars was the god of war and aggression. Highly impatient and competitive, many Aries have the fighting spirit of your mythological ruler. You love to be a hero–or to be swept away by one. As the zodiac’s first sign, you were born to be number one. You’re a solo star who steals the spotlight and inspires everyone with your confidence. Yeah, you can be impatient, even a little bossy, especially when you don’t get your way. As the “baby” of the zodiac, you need lots of attention, and can throw quite the tantrum when you don’t get it. Fortunately, you rarely have a problem turning heads. Your friends love to follow as you lead them on the latest adventure. Make sure to let other people be the boss every now and then, too, or you could alienate potential allies. Focus your competitive streak into a diva-worthy goal, delegate to your troops, and you’ll rise to the top! The ruling planet for Aries is Mars.